This article analyzes whether psychiatric disorders can be considered different from non- 4 psychiatric disorders on a nosologic or semiologic point of view. The supposed difference 5 between psychiatric and non-psychiatric disorders relates to the fact that the individuation of psychiatric disorders seems more complex than for non-psychiatric disorders. This individuation process can be related to nosologic and semiologic considerations. The first part of the article analyzes whether the ways of constructing classifications of psychiatric disorders are different than for non-psychiatric disorders. The ways of establishing the boundaries between the normal and the pathologic, and of classifying the signs and symptoms in different categories of disorder, are analyzed. Rather than highlighting the specificity of psychiatric disorders, nosologic investigation reveals conceptual notions that apply to the entire field of medicine when we seek to establish the boundaries between the normal and the pathologic and between different disorders. Psychiatry is thus very important in medicine because it exemplifies the inherent problem of the construction of cognitive schemes imposed on clinical and scientific medical information to delineate a classification of disorders and increase its comprehensibility and utility. 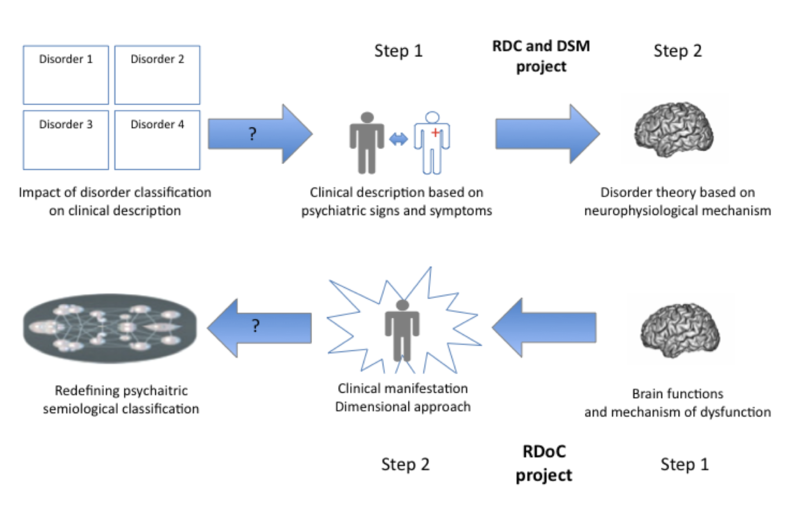 The second part of this article assesses whether the clinical manifestations of psychiatric disorders (semiology) are specific to the point that they are entities that are different from non-psychiatric disorders. The attribution of clinical manifestations in the different classifications (Research Diagnostic Criteria, Diagnostic Statistic Manual, Research Domain Criteria) is analyzed. Then the two principal models on signs and symptoms, i.e. the latent variable model and the causal network model, are assessed. Unlike nosologic investigation, semiologic analysis is able to reveal specific psychiatric features in a patient. The challenge, therefore, is to better define and classify signs and symptoms in psychiatry based on a dual and mutually interactive biological and psychological perspective, and to incorporate semiologic psychiatry into an integrative, multilevel and multisystem brain and cognitive approach.